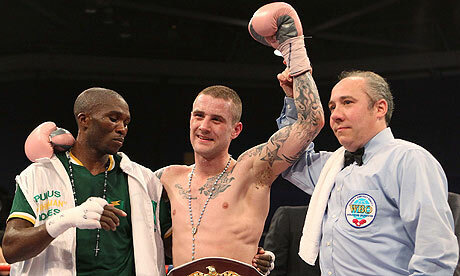 There are many ways to win a fight, but Ricky Burns again did not stray far from his stick-and-move formula to turn back the rugged challenge of Paulus Moses and retain his WBO lightweight title in front of an appreciative Scottish audience. Judges awarded him the decision by margins of 119-110, 120-110 and 117-110 – a little harsh on the African challenger, from this vantage point, at least: I had him winning 116-113. The Coatbridge man remains on track for a considerably bigger fight in June, against the Londoner Kevin Mitchell. Burns got a lager-spilling reception from the 6,000 fans in the Braehead Arena on his return to a Glasgow ring after an absence of a year – although it was a bit rude to play Flower of Scotland for the champion and be left to wonder what the Namibian anthem sounds like. Snubbed or not, Moses was intent on making it a long night for Burns. The heavy-handed man from Windhoek, a former WBA champion, rumbled after Burns, who took a round or two to hit a rhythm, his pink gloves incongruous but effective weapons. The Burns right, thrown at an angle over his opponent’s guard, hit the target with encouraging regularity as he took control of centre ring, giving ground only when covering up on the ropes, a strategy that non-plussed the challenger. Reduced to charging through a blizzard of pink, Moses soaked up a steady flow of blows to the head but remained dangerous on the counter. He looked to have shared the fifth and took the sixth, growing strong as Burns struggled to hold him at bay. Moses continued to throw big shots in bunches, not all of them catching Burns’s high guard. The boisterous crowd of only a quarter of an hour earlier idled in relative silence, and the chatter from the visitor’s corner grew ever more urgent. An overhand right rocked Burns early in the ninth but he came back with one of his own and a few more jabs and uppercuts near the bell to take control going into the championship rounds. The crowd came to life in the 10th, as did Burns, weathering the now less frequent attacks by Moses – who looked his 33 years – and working more vigorously to the ribs. As the seconds ebbed, so did Moses. The 12th started curiously. They hugged at the start, rather than merely touching gloves, then Burns looked distractedly down at his shorts; had it been Floyd Mayweather in front of him rather than the gentlemanly Moses, he would have spent the next 10 seconds staring at the ceiling. He returned to work quickly enough, dancing clear of danger, and banging out enough jabs to consolidate his advantage. Scotland would be no Promised Land for Moses.